Fort aan Den Ham is a relatively small fort. It’s main function was to protect the railway, this lies on an elevated bed and forms a weak link in the defence line. A so called access. The two nearest forts, Fort bij Krommeniedijk and Fort bij Veldhuis provided protection by the overlapping range of their cannon. The earth walls were made in 1896. In 1903 the buildings were completed and housed 161 men in 1914. The defence function was ended by Royal decree in 1956 and the fort was converted to an ammunition depot.Sadly, much of the original interior was then removed. All but one of the wooden walls were torn down and all windows, gun-ports and connecting-doorways were barricaded with brick walls. Until the end of the 80’s the fort was used as an ammunition depot. In 1985 the house of the custodian was torn down. For ten years the fort was abandoned and nature took its chance. Until, in 1994, some “fortomaniacs” decided this fort had to be rescued. To even reach the fort they had to forge their way through abundant weeds.In the fort about 30 walls of 2 feet thick masonry had to be demolished, electricity renewed and new water system laid. Then they started to decorate the interior as it was in early 1900. Because the visitors day of the 1995 monuments day was a great success it was decided to open the fort to the public. For this the foundation “Stichting Fort aan Den Ham” was created. The objective of the foundation is to create a permanent exposition about the defence line of Amsterdam, and the role played in this by Fort aan Den Ham. Also to recreate a part of the fort, offices of the commandant and officers, sleeping quarters of the men, sickroom etc., to give an impression of life at the fort around 1900. Stadsherstel Amsterdam has a leasehold from april 2012 on the fort complex. The Volunteers Foundation “Fort aan Den Ham” manages the fort building and the nature of the fortress island as a military museum. 1892: Expropriation of the land and ground works taken place. 1896: Start building bombproof buildings. 1903: Completion. Suitable for occupancy of 171 men. 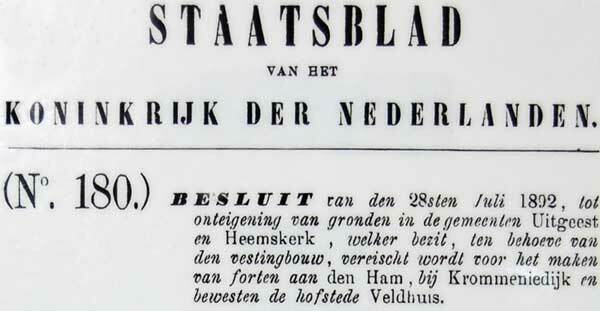 In 1892 the Royal decision to expropriate land for fortification for the forts Veldhuis, at Den Ham and Krommeniedijk. In 1895 there were already earthen walls and began building the so called bombproof buildings in the forts. The fort was in 1903, more than a century ago, delivered. The fort consists of the main building and the front building. The main building contains a kitchen, Officers rooms, Office of the Commander, sick place, canteen, storage for gunpowder, projectiles and cartridges, dormitories, troops stay, 2 casemates, room for the telegrapher, privacies and a laundry. The Main Building is located at the throat side of the fort and through the Poterne attached to the front building. It is the residence of the sergeants. sleeping accommodation for the n.c. officers and the lookout, through a “ladder” reach. The lookout is actually a large “steel helmet” with peep-holes from which one had a good view over the inundated area..
Fort aan den Ham had as main armament two hefkoepels each with a relatively small, “6 cm” gun (Krupp Guson) to take the inundated area and the railway line under fire. The guns were equipped with grenades from the fort, which in the fort were made, and through the Poterne and sheltered to patrol the guns were brought. The hefkoepelgeschut is during the Second World War by the German occupiers dismantled and transported to Germany. In addition, the two towers blown and destroyed. Furthermore the fort possessed 4 Gardner M90 machine guns that were prepared in the casemates on the Throat Side (the “unprotected” side) of the fort to defend. The machine guns were positioned so that crossfire on the access could be given. And at the throat side of the fort embrasures in each steel door and steel window, which a soldier with a gun could shoot at any enemy advancing when the inundated area was crossed. During the mobilization period 1913-1918 and from 1939 until May 1940 the fort was manned by Ned. army. After May ’40, the fort was abandoned. In the second half of 1940, a German military engineer inspection at the fort was held. Around the fort building are 2 patrol paths, the inside and on the outside of the fortress island. Here you can also see the “natural” barriers and see how any enemy attackers had to defy such as hawthorn and willows on the waterside. Just past the fort the secondary battery is located. Here was the heavy artillery positioned to fight to continue over the long haul. In season, open on wednesdays.